This character profile has been written for Fennelwhen, one of our supporters. If you enjoy it, you can check out the other profiles we’ve written, too! The kitten was in his horns again. At first, Fennelwhen had not understood why he should have a cat at all. They generally don’t keep pets this small back in Mulgore — growing up his own favorite pet had been a wolf, and it had been less a pet as such and more a guardian for the whole family, more his mother’s than his, personally. When Astrid had first suggested he get a pet, he’d looked upon the tiny little bundle of fur she’d brought to his quarters in Dalaran and tried to beg off. Look how small she is. The cat was at that time barely as big as one of Astrid’s hands — it had looked like a tiny raft swallowed up in an ocean when she’d put it in Fennel’s palm. He supposed she wasn’t a kitten anymore, but it was impossible for him not to think of her that way as she yowled and clambered around on his horns trying to get to his beard. She would spend hours grooming his fur if he let her. And some days, he felt like he might as well. “You’re excited this morning.” She’d clambered down from his horns and was happily making bread in the fur on his back. That’s what he called it, anyway — the reality was she was trying to make a nest to nap in, and he was thankful for his relatively dense fur and thick hide. 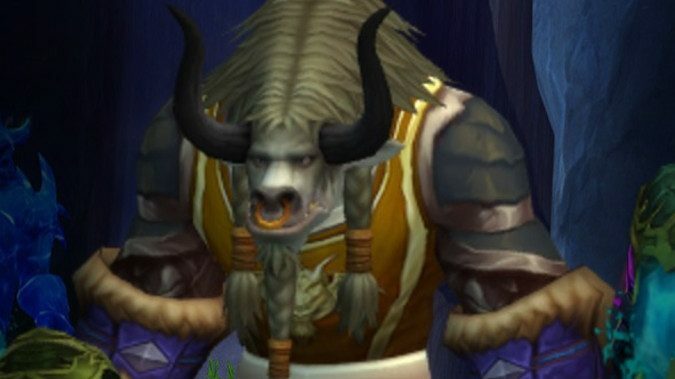 Astrid had a wide range of tiny little white scars where her own cat had playfully swiped at her, but as a Tauren, he didn’t have the same problem as the Blood Elf did. Still, if he let her get settled she’d have him trapped at his desk all day. He stood and dipped his head so that his horns touched the desk. She climbed down, but not without another yowl of protest and a convulsive grab at his muzzle, holding him still for a few frantic licks at his beard. He allowed this. Truth was, he was afraid to stop her, because to him she still looked so small and fragile. When she felt mollified she gave him a low murrr and a head bonk before she walked, head high and tail jigging, to find a nook to preen herself in. Chuckling, Fennel walked with a little difficulty through his quarters. They tried, the people of Dalaran, but their idea of neutrality was often Everyone’s free to be uncomfortable in our human sized city. He’d managed to get comfortable sleeping on three human sized beds pushed together, and he’d managed to learn how to navigate their doors because those were built for two or three humans to pass through at once, but the whole city still felt like a child’s play house to him. He picked his way down out of the Horde enclave — now almost deserted with everyone off fighting elsewhere in the world, while Dalaran kept its vigil over the Broken Isles. He stopped to look over the water at the jutting green-and black skeleton of the Tomb of Sargeras, remembering the now-gone pillar of bilious green fire that had blasted up into the heavens. Come fight, the summons had of course come to him as well. But Fennel was old now — his fur graying, his body strong but feeling the years of war in sore joints and puckered mementos carved into his skin — and he’d never liked fighting much. The spirits that clung to him, that whispered in his ears were spirits who preferred to mend and guide and he’d come to agree with them. He’d fought to save Azeroth only for her people to seemingly go mad, and now he was content to wait and see if they came to their senses. If not, he could always head to Silithus, try and help there. But it felt less and less like his fight as time passed. If it had ever been. He stopped at the Legerdemain Lounge for his usual, a large hard Mulgore sourdough, and walked with it to the statue of Antonidas. He didn’t know much about the mage, but there were birds that had made the statue and the garden around it their home. It took only a few moments to tear chunks of the bread off for the birds to dine on, and then the rest he ate himself, remembering his father’s broad, strong hands working on dough next to the clay over back when they’d lived in the Barrens. Before Mulgore. Before the Horde, before he’d ever expected his people to have a home. The Horde gave us Thunder Bluff. A home for our people. It was strange to Fennel to find himself watching the little grey doves as they swarmed over the bread, tearing pieces away in their little beaks. Around him the quiet city kept its vigil, and the world seemed still, an illusion he knew for a lie but didn’t try and break. Sooner or later he’d have to make a choice, he knew that, but right now he was enjoying the pretense. It felt like they’d barely managed to win against the Legion and there had been no time to celebrate, no time to be amazed at what they’d accomplished. And he felt the need to take that time, if only for himself. The walk home took him into Breanni’s shop. “Try her and see. Hold out a hand.” He did so, and the bird flapped across the space to alight on one of his fingers. He offered it the bread, which it took in surprisingly delicate bites as compared to the grey doves from the streets. After a minute or so, it flew back and landed on Breanni’s shoulder. He paid for his purchase and left, hoping the cat would like the new toy, knowing if she did he’d have to come back for a new one soon. Her idea of love often seemed quite destructive. His horns bore the battle scars as well from her frantic scrabbling. Here he was, essentially a scratching post gone to seed while the world burned and writhed all around him. Eventually, he’d take up his mace and go forth to do what he could, where he could. But for now, his pace quickened, because there was a small cat in his room and he had a mouse for her, and it was all he needed. This character story was written as part of our supporter benefits. Want to see yours? Support us at the $25/mo level for one month or more and Matt or Anne will write it up. If you’re already a supporter, click here to submit your character info to have your own profile written!